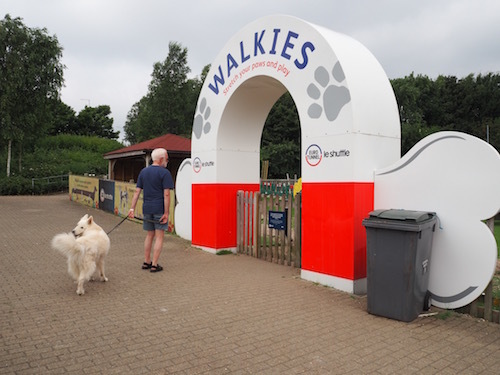 In July 2016 we decided it was time for a trip to the UK again. Visit our cousin and do some shopping (taking advantage of the favourable exchange rate). 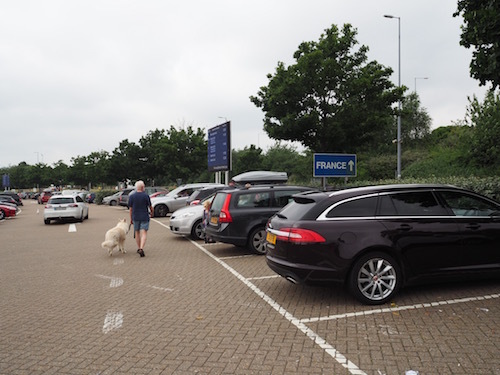 Because of our dog, we "had to" take the Channel Tunnel (the only crossing where pet and owner can stay together) and because of the Tunnel's fare we took the small campervan. 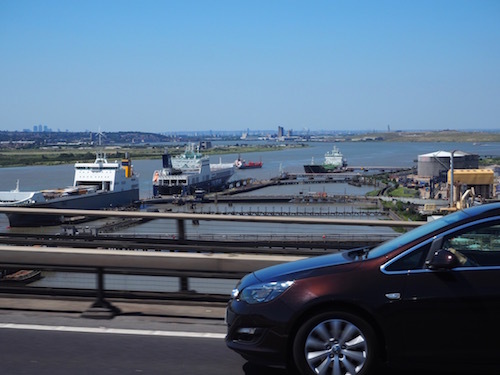 As preparation we booked the Channel crossing, a camping site which looked promising and two Dartford Crossings. 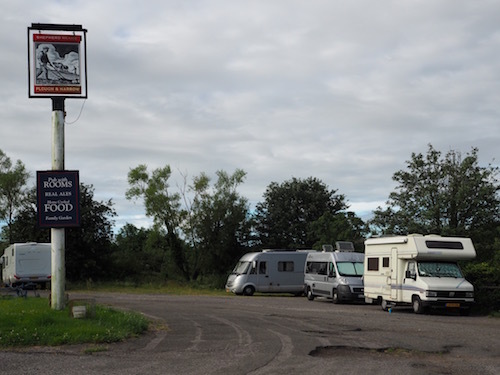 We also found out that England doesn't know the Stellplatz, so common in Germany, but that many pubs offer an overnight place, of course preferably in combination with a meal or other consumptions. 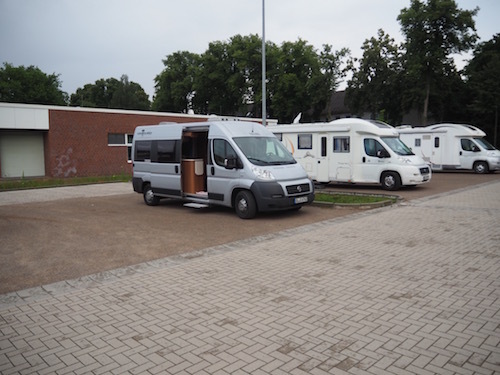 We left after dinner and drove the first 160 km (100 mi) to Dülmen where we stayed the night. 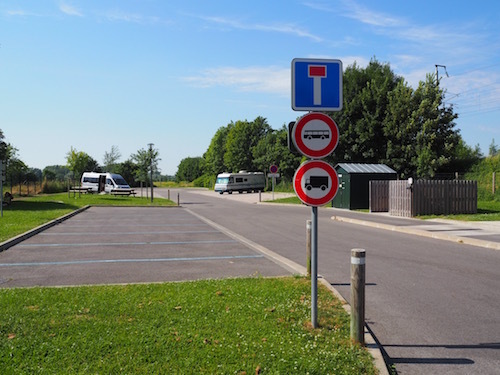 The motorhome site is conveniently close to some supermarkets and other shops. 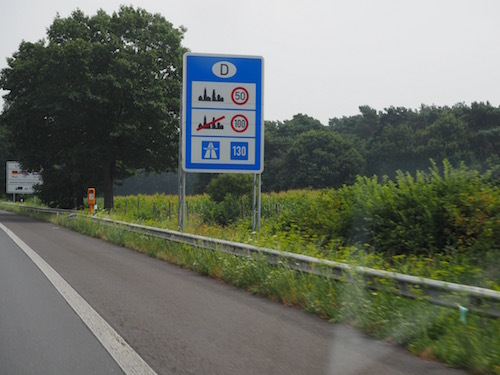 From Germany we crossed a bit of the southern part of the Netherlands and from there we entered Belgium. 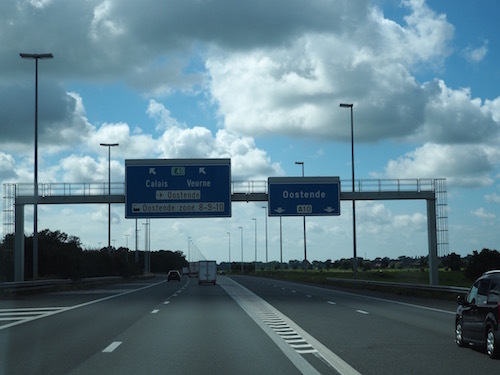 We took the motorway where we had driven hundreds of times in the ten years we lived in Beerse. 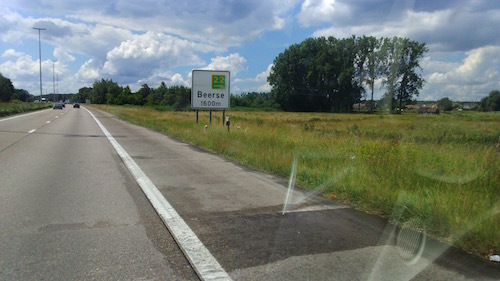 Only this time we didn't take the Beerse exit. 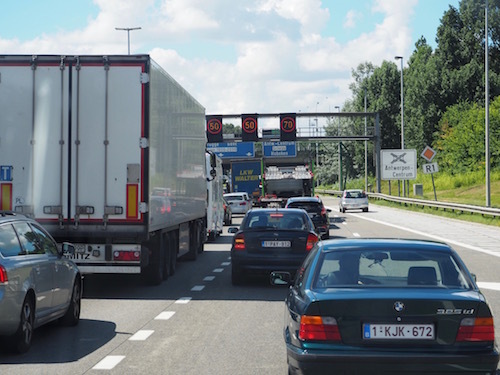 Because of a giant traffic jam near Antwerp we left the motorway and took the inner ring, also very well-known to us. 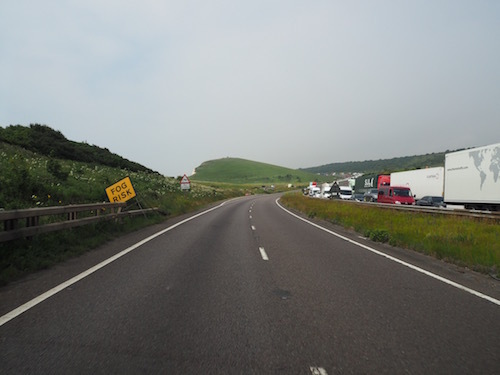 Further south, there was no trace of the heavy traffic. Fortunately! 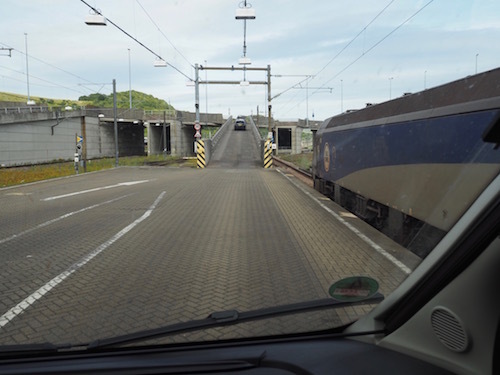 ... and when we entered France, there was hardly any traffic. 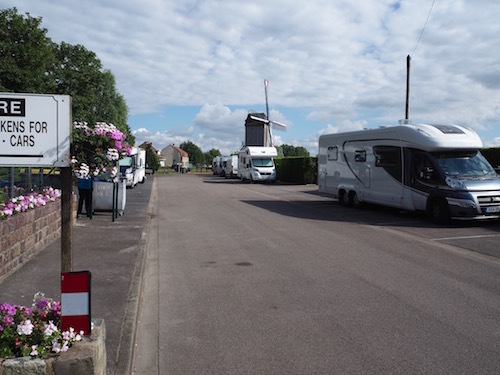 In Hondschoote is a nice motorhome site close to the famous Spinnewyn postmill. 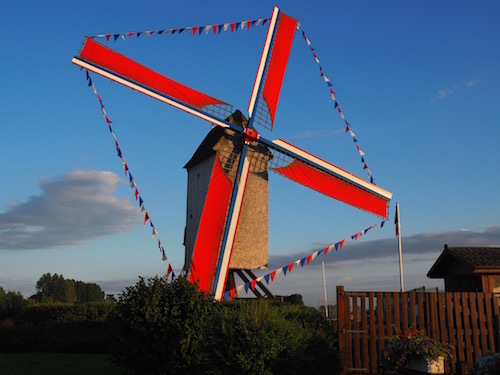 The mill was faithfully rebuilt in 1993 on the occasion of the bicentenary of the Battle of Hondschoote on 8 September 1793 between French troops and Anglo-Hanoverian-Austrian forces. France was saved and the English lifted the siege of Dunkirk. Within a few minutes the windmill was fully dressed for the festive occasion. From 11 PM to 11:30 PM there was an incredible fireworks show. Motek was really frightened by the noise. 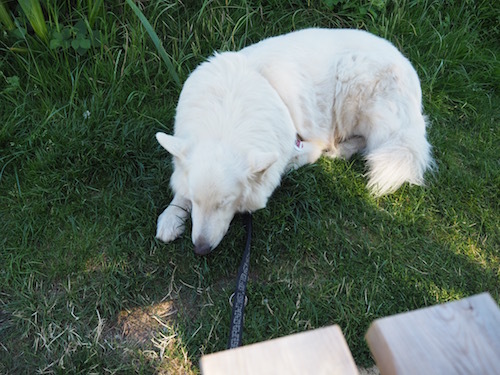 His fear for loud bangs started only six months ago, during a thunderstorm right above our heads. We tried to catch part of the show on video, as an experiment. The video takes only 1'08". 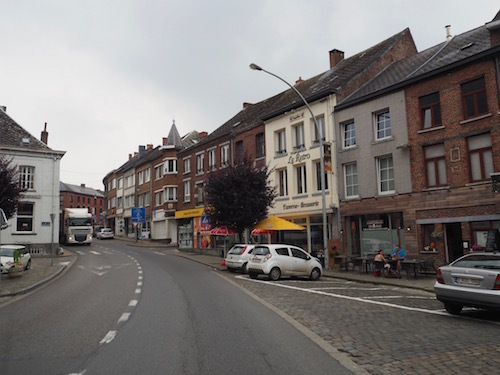 Only a short drive from Hondschoote is the old town of Bergues. 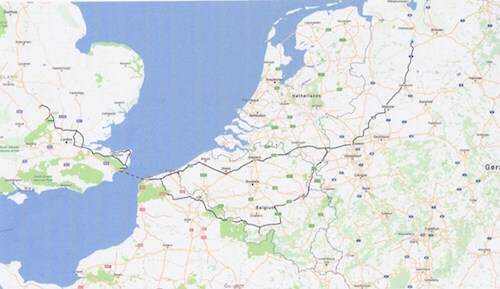 We're still in French Flanders, the region where they once spoke a Dutch-like dialect. 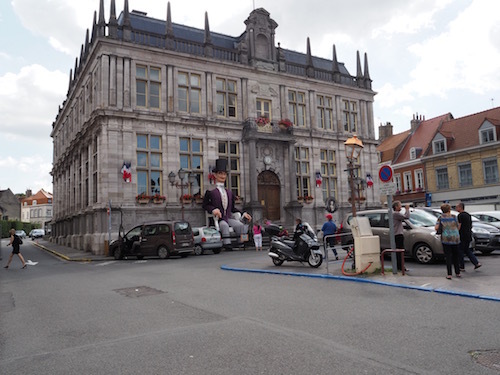 In front of the Bergues town hall sits this giant (6.50 m, abt 22' tall) in memory of the election as deputy of Alphonse de Lamartine. 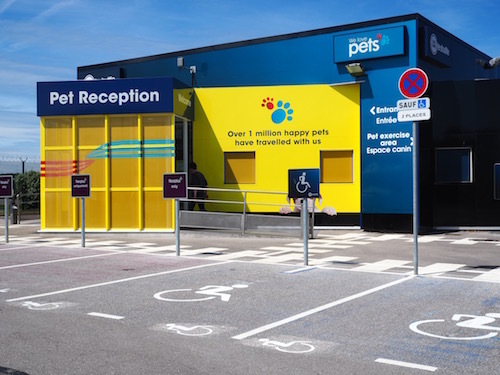 The Euro Tunnel has done everything to present themselves as animal-friendly. As far as we're concerned, they succeeded! 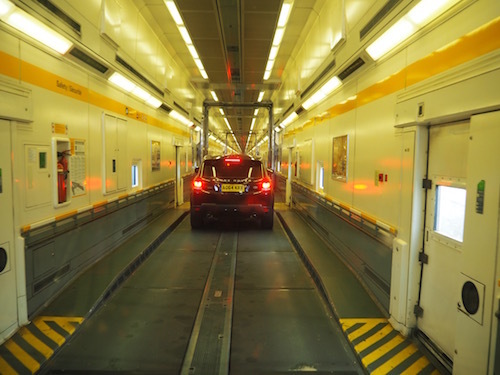 There are three categories: cars (double-deck wagons), higher vehicles and lorries and buses. We fit in the middle category. 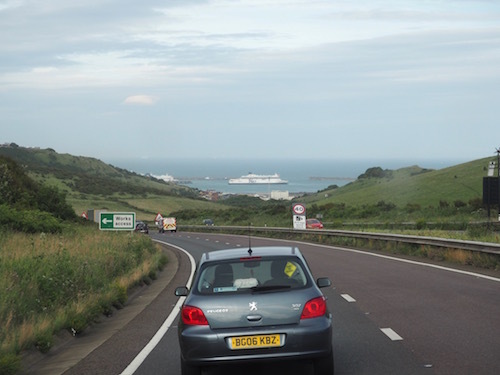 After 35 minutes we can drive from the train in Folkestone and into the United Kingdom. 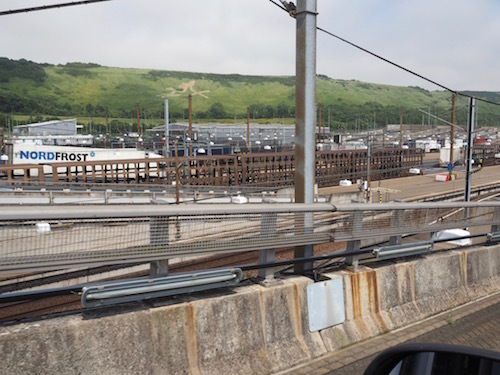 North along the English Channel coast (and its famous white cliffs). The busy ferry traffic is obvious. 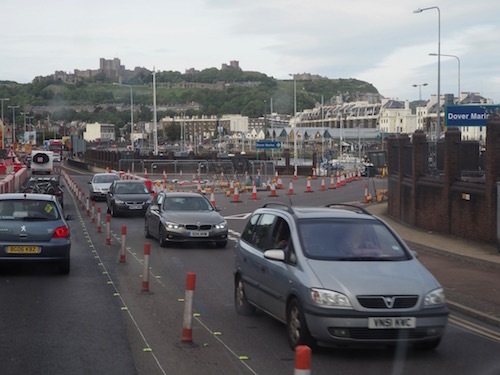 The A20 through Dover has been a mess like this as long as I can remember (which is quite long). 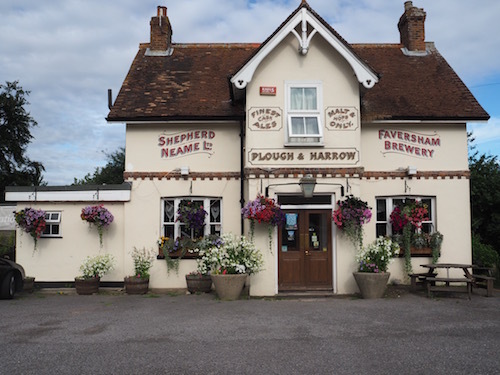 ... Tilmanstone, where the Plough & Harrow is, one of the country pubs which welcome motorhomers. 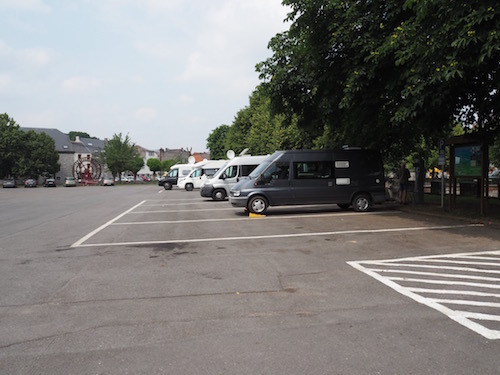 We were not the only campers who slept in a motorhome on the Plough & Harrow's grounds. 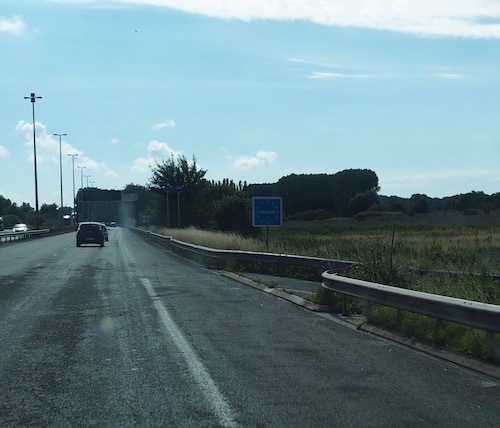 Here the two roads leading north, divide. 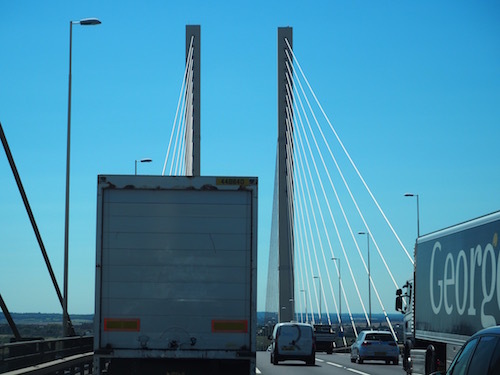 The Dartford Crossing, which we had pre-paid, goes left. 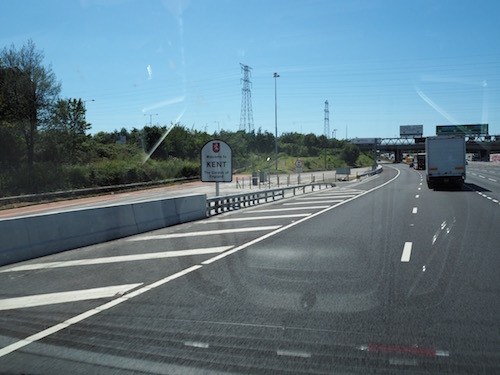 Our iGo navigator, instructed to avoid toll roads, told us to drive straight on. Too late we realised what we had done wrong. 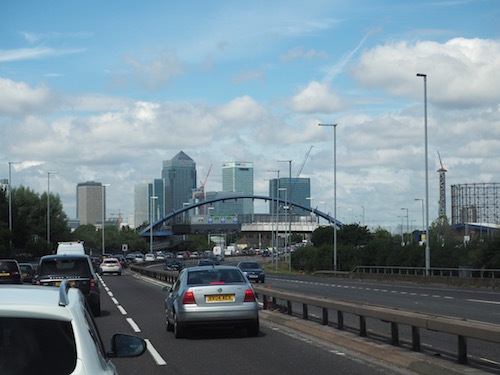 London offers a strange mixture of old and new. 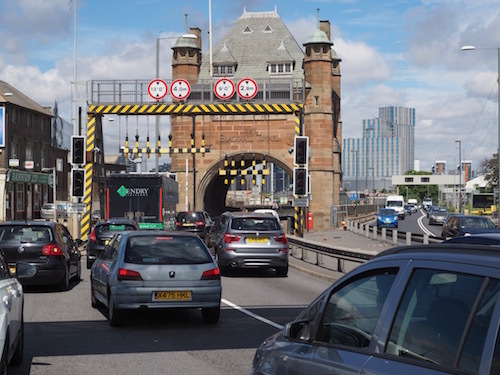 The Blackwall Tunnel entrance takes us back into the 19th century. 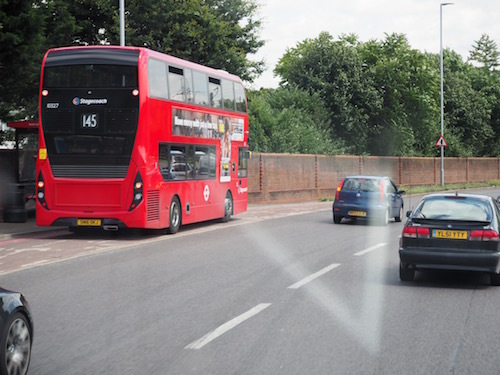 That we are in the London area is clearly shown by the iconic red double-decker bus. 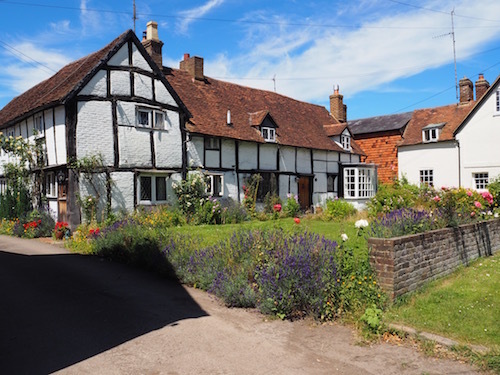 After some shopping in Milton Keynes, our next destination is The Fancott in Toddington, Bedfordshire. 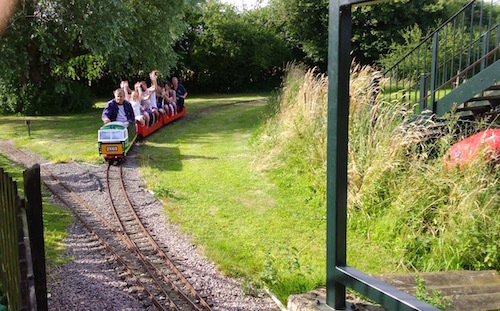 A famous local attraction is the Fancott Mini Railway. 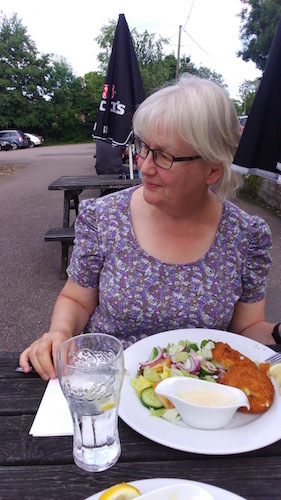 They serve nice fish cakes, in line with our dietary needs. The Fancott's Wi-Fi allows us to listen to our favourite radio programme on Sunday morning. 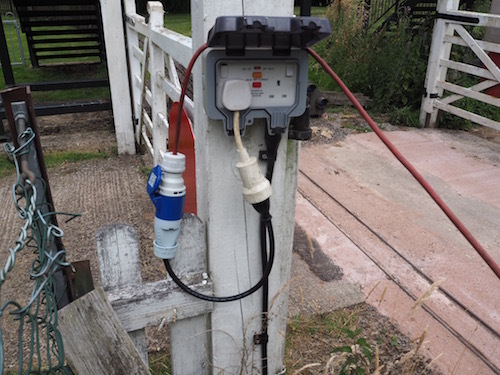 They even offer electricity for campers. And, with some of the adapter cords that I made long ago, we are able to hook up. 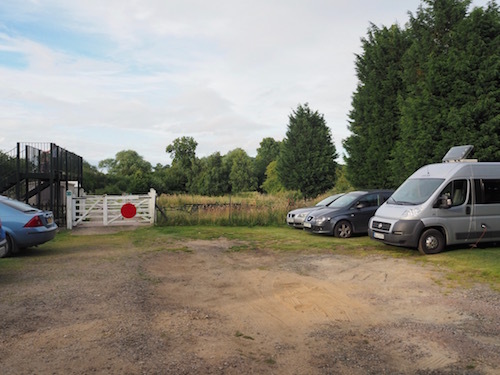 For the next two nights we have booked a pitch on the Town Farm Campsite in Ivinghoe, Buckinghamshire. 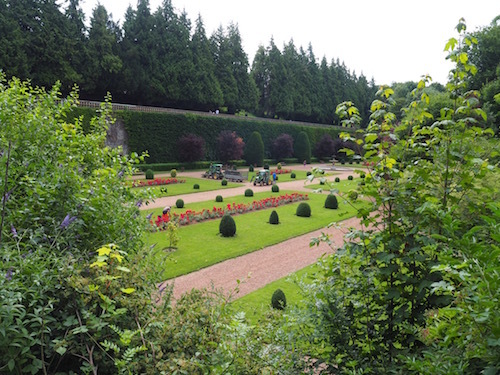 Beautiful scenery, no shade! 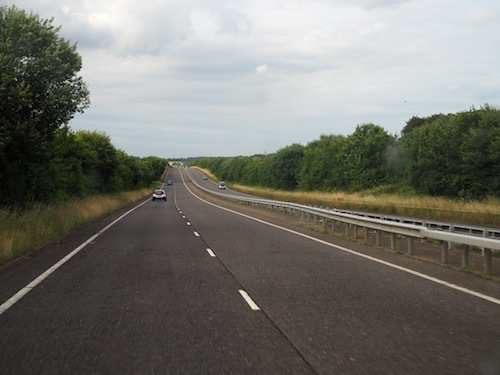 Our cousin Christine shows us how to drive to Aldbury, Hertfordshire over extremely narrow country roads. 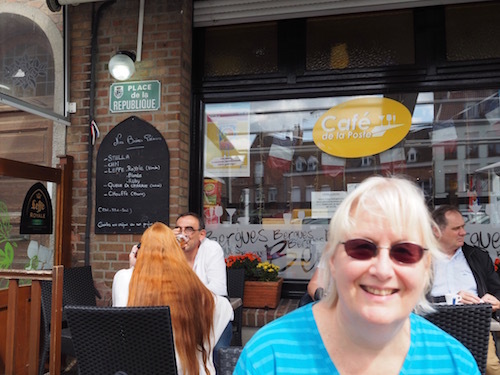 We have a very nice lunch at The Greyhound and buy some food stuff at Tesco's. 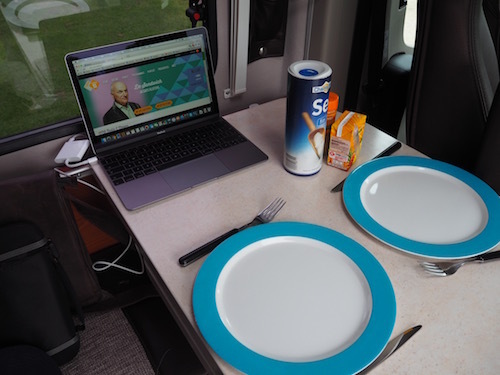 At night, we fire up the Safari Chef to prepare our meal. Despite the unorthodox composition, grilled salmon and grilled leek, it tastes fine. 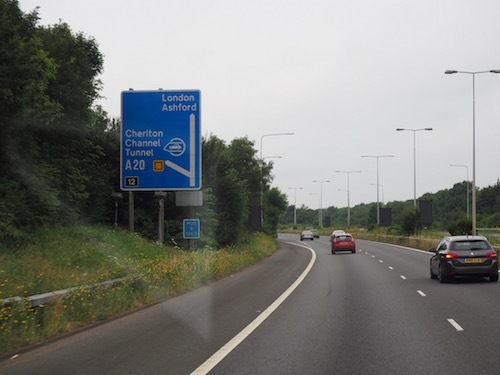 On our way back south, we don't miss the Dartford Crossing. 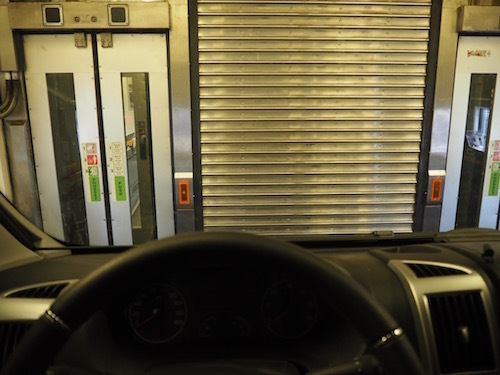 So we haven't paid our Dart Charge (£ 3 each way) completely for nothing. 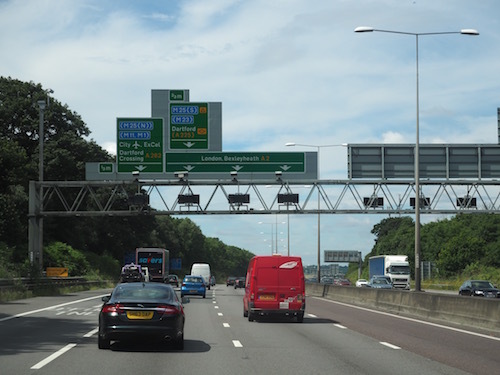 Immediately after the bridge, we turn left and continue via the A2/M2 east, along the north coast of Kent. 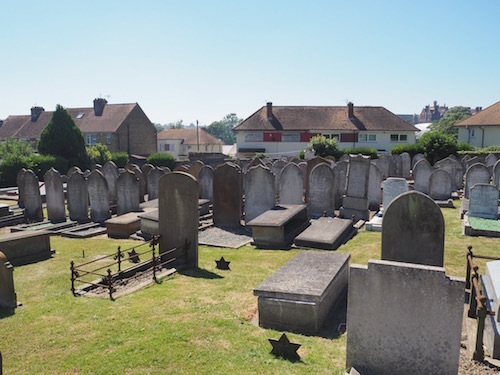 Ramsgate, famous as residence of Sir Moses Montefiore, has quite a big Jewish cemetery. 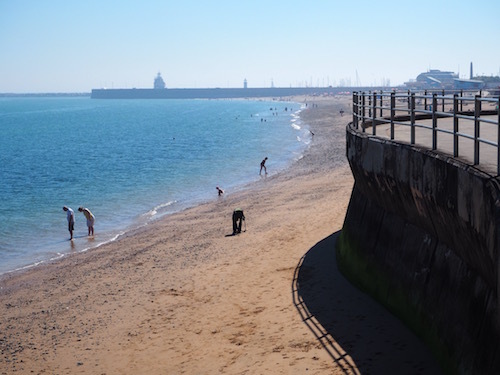 Ramsgate’s main attraction is its coastline, and its main industries are tourism and fishing. 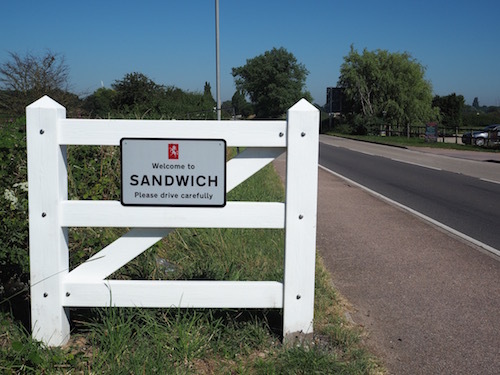 On our way south from Ramsgate to Deal we pass the historic town of Sandwich. 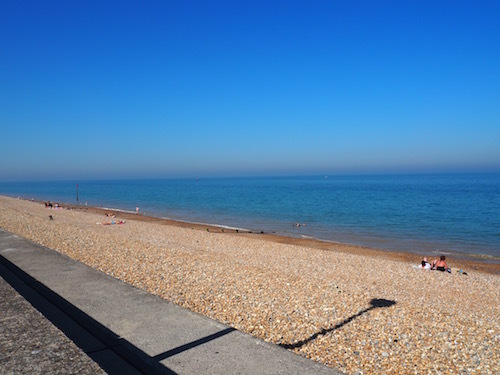 The former fishing, mining and garrison town Deal is another seaside resort. 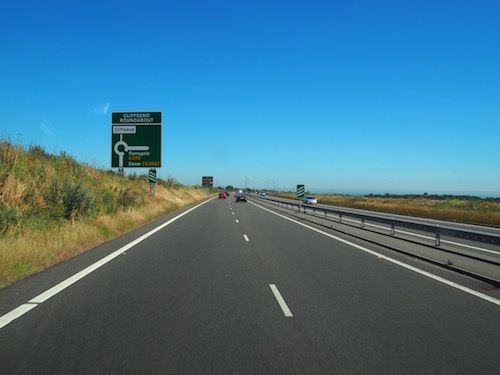 It is located halfway between Ramsgate and Dover. 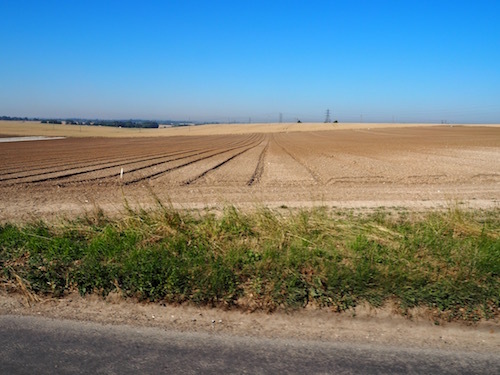 The flat coastal landscape of east Kent. 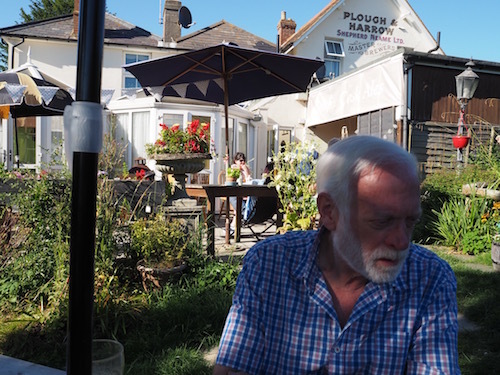 We stop once more at the Plough & Harrow in Tilmanstone. 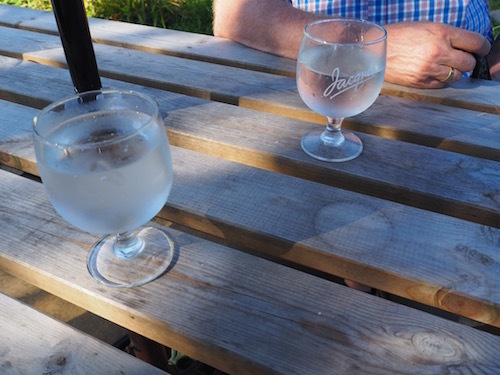 Together with two British couples we enjoy our healthy drinks, first in the garden and later in the taproom. 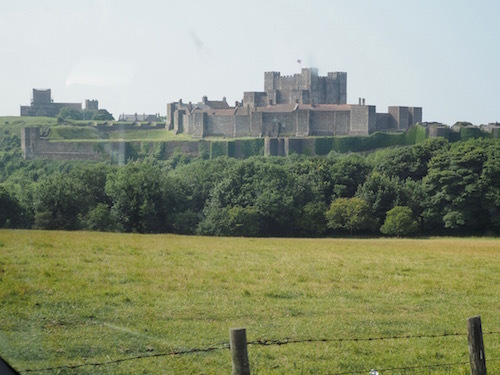 Driving to the Euro Tunnel terminal in Folkestone, we pass Dover Castle on our left hand. 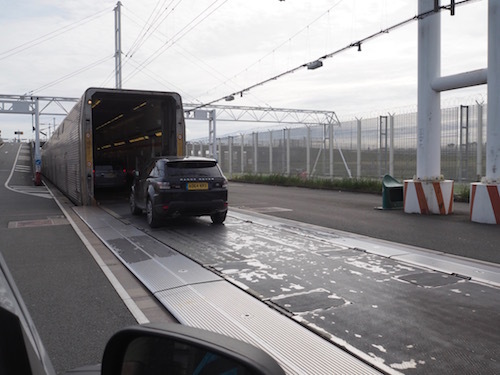 On the radio news we have heard about the long rows of trucks waiting for the ferries to the Continent. Waiting times rose to 14 hours! 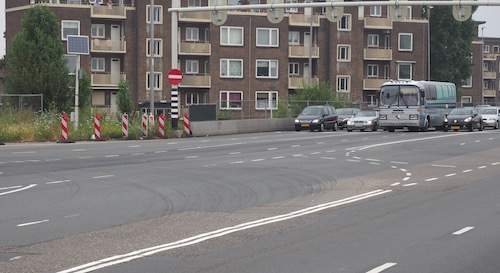 Poor drivers! but first another opportunity for Motek to stretch his legs. 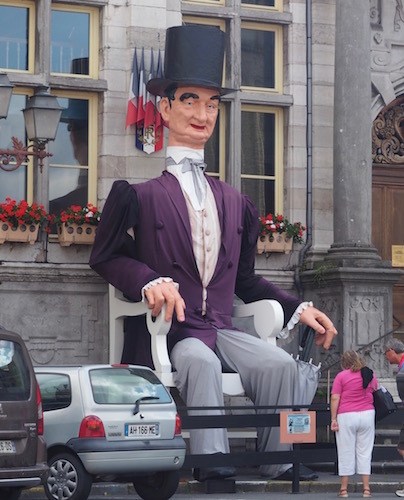 ... this time at the front of the wagon. 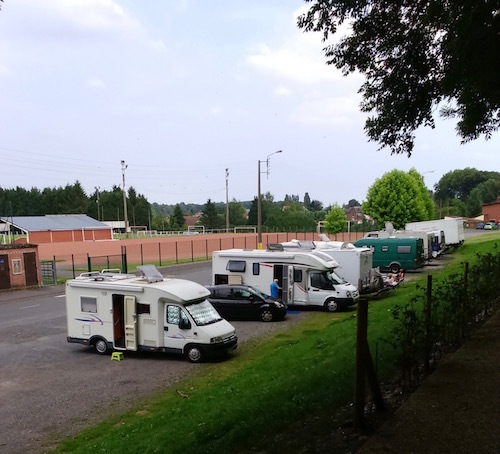 Saint-Omer has a dedicated parking for campers, even with a toilet. 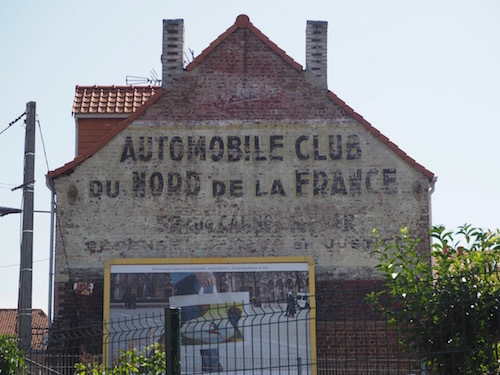 Characteristic for France: houses "decorated" with advertisements, often many decades ago. 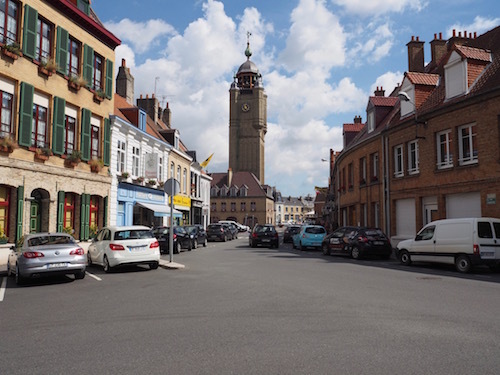 Saint Omer in French Flanders has seen a lot of trade in its past, from linen to vegetables. 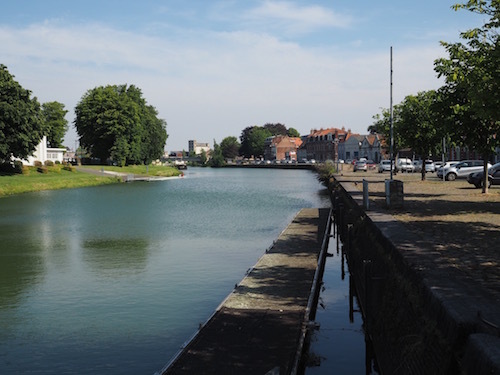 The Quai is still there. 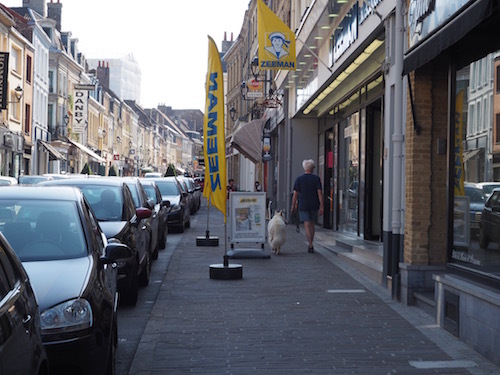 Dutch shops are to be found everywhere. 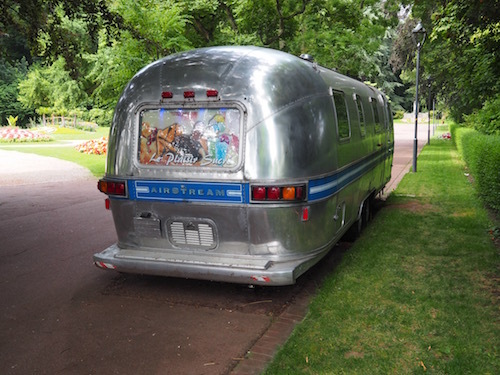 In the beautiful public park lots of flower beds (in the French colourful style) and this Airstream caravan, now used for selling ice-creams. 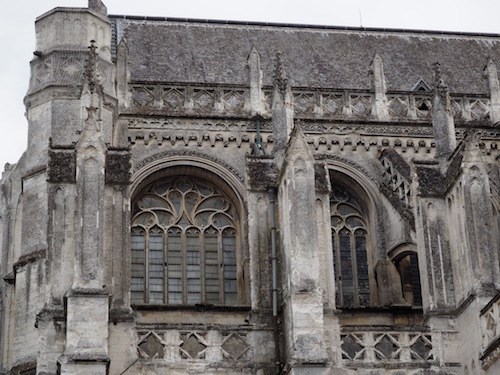 Building the Notre Dame cathedral of Saint-Omer has started in the 13th century, but previous chapels have been built on the site as early as the 7th century. 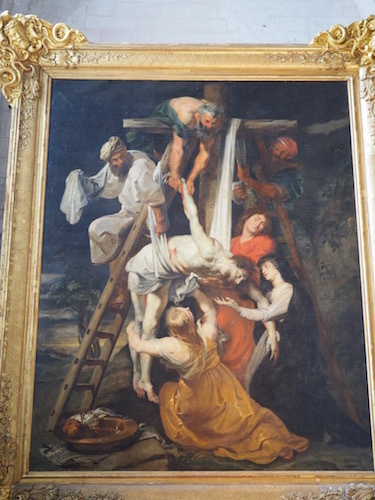 The main attraction of the cathedral is this Pietà by Rubens. 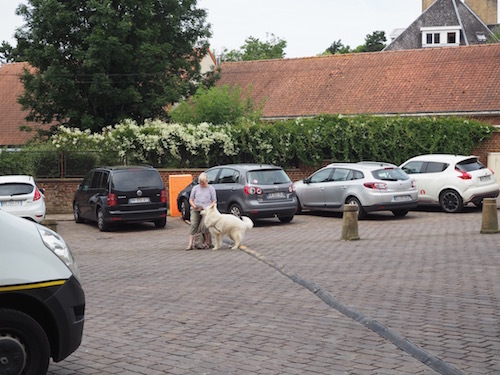 We thought taking a dog into a church wouldn't be appropiate. 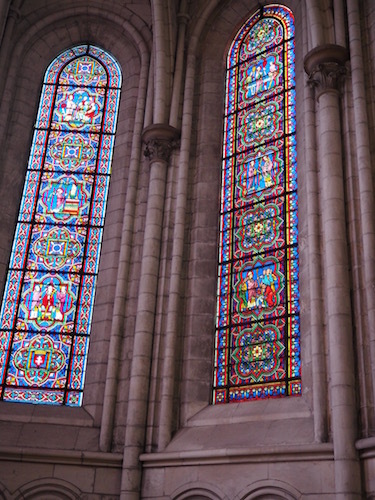 So we took turns in visiting the cathedral. One of us stayed with Motek. 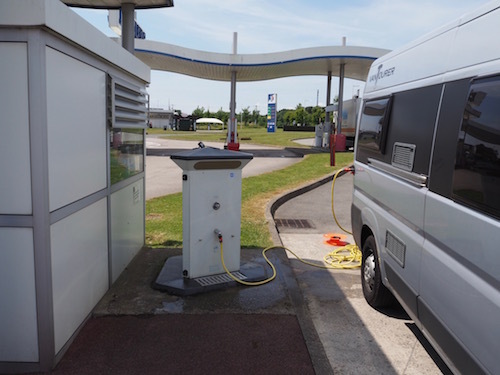 Apart from the lowest prices for diesel fuel, the Leclerc supermarkets also offer water for motorhomers. 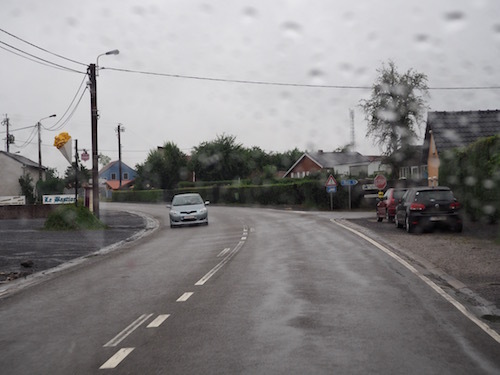 Next stop is Bavay, near the Belgian border. 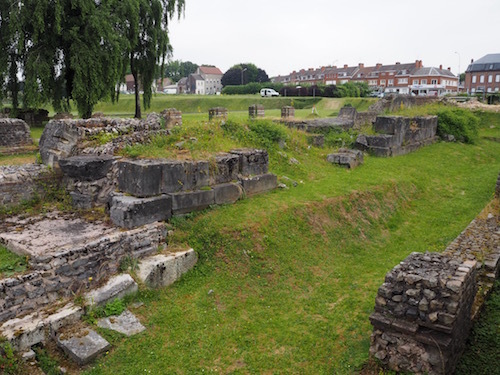 Archeological site in Bavay, a Roman forum. 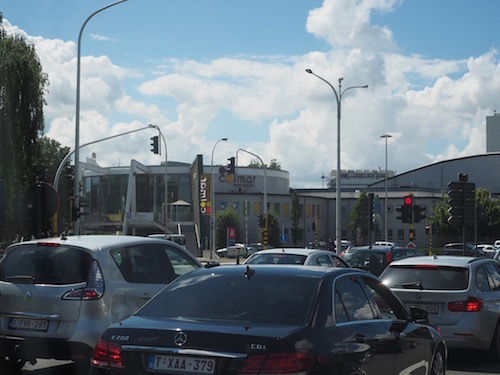 We have crossed the border and are in Belgium again. 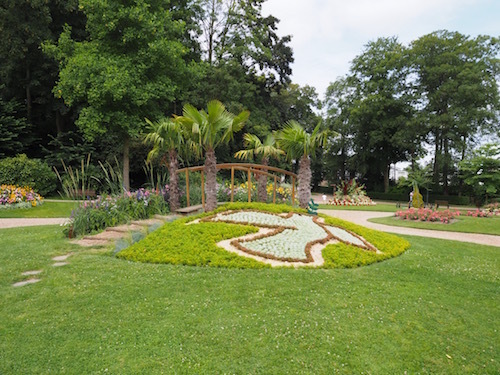 Our destination is Nismes. Dedicated parking lot near the water. 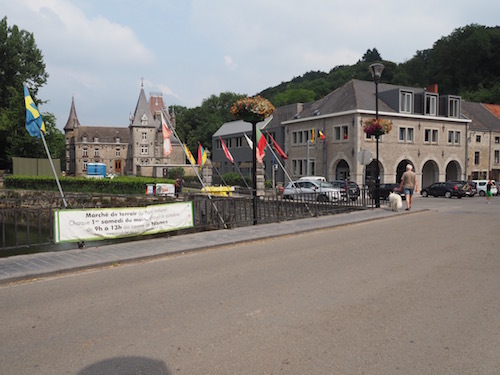 On the other side of the street is the castle. 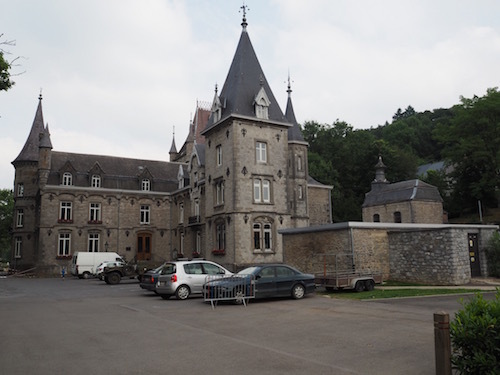 The local castle is taken over by Allied forces. 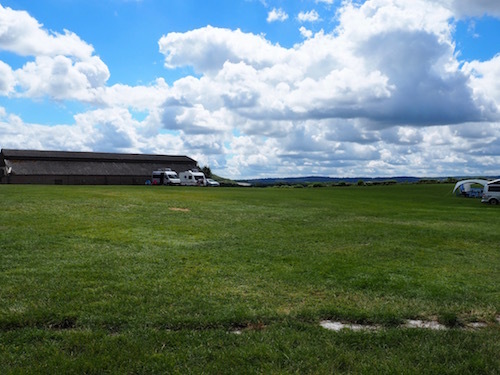 They tell us that in the context of the 1939-45 re-enactment weekend, tomorrow there will be a lot of black powder shooting. 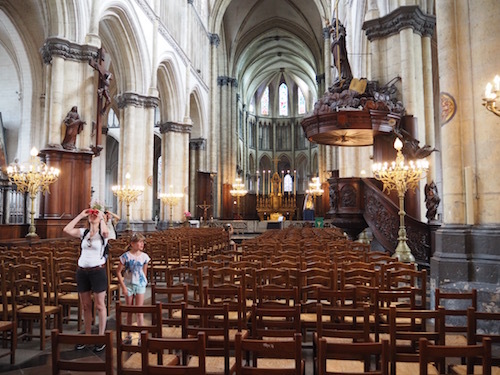 After our experience of the Quatorze Juillet, not what we have in mind for Motek. The next morning is wet as can be. 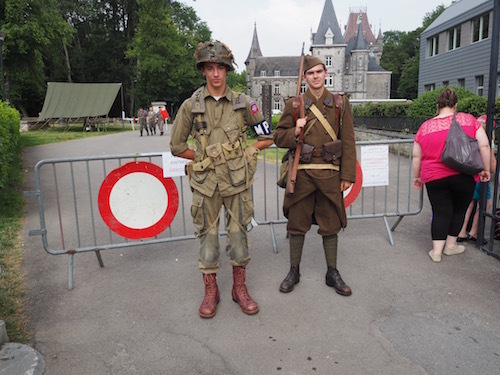 We pity the players in the War re-enactment. 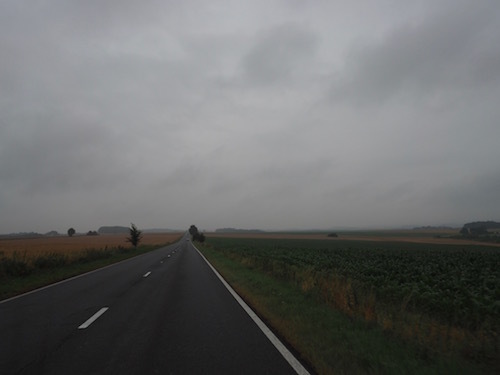 When the forecast doesn't promise any improvement, we decide we might as well drive home. 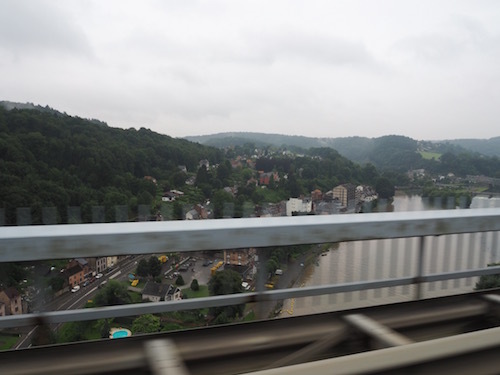 Maastricht-Venlo and into Germany, via the Autobahn. 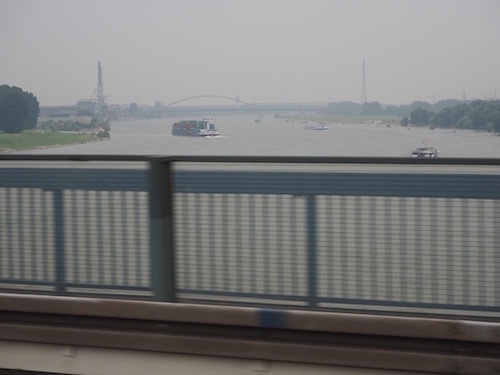 When we cross the River Rhine in Duisburg it is still grey. 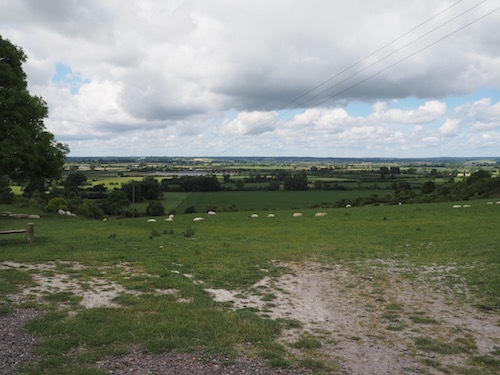 But the last 100 km (60 mi) it is dry and sunny. 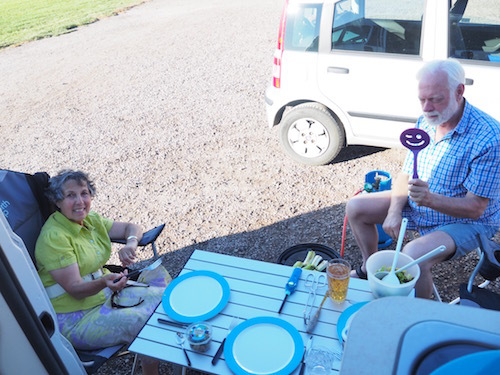 After 2100 km (abt 1300 mi) we're home again in the best weather one can imagine!